My Zuke's hayride was supposed to have started a while ago. I'm wondering where the driver of this wagon has gone. Hmmm......Mom! Oh well; I guess I could take this opportunity to introduce you to our newest technology here on 5 Minutes for Fido: the Giveaway Tools widget. It should be down there at the bottom of the post, asking you to enter your name and email address. Don't worry, Mom over at All Things Dog Blog assures me your email won't be used for anything except getting in touch with you when you win. That's okay with you, right? This new widget is the latest in giveaway gadgets. We used to use one named after a helicopter, but this new one has a few extra features we're trying out. Let us know what you think. Did it wake up for you easily? Sometimes Mom says she has to tickle it to come alive by clicking on the post title. NBD, I guess. So here's the deal. In this new widget you get to choose your entries. There are lots of choices, so just do the ones you like. I liked the one where Mom could put my picture in this cute Zuke's frame. Don't I look handsome? Too bad I can't enter; but YOU can! You actually get points for putting your dog's picture in a frame that WE MADE FOR YOU. It doesn't get any easier than this! There are lots of other ways to enter also, like Tweeting, social media follows, pinning, and Vine or Instagram videos. FYI, we'll be picking one video to win a $100 Gift Certificate that you can spend on anything you want--seriously! Not into Vine or Instagram yet? It's okay. I'm not either. But Mom and our partner Miss Paris will be posting How To's on doing these. Want to get started right away? Check out this quick starter on Vine. Mom says that it only takes 2 minutes to make and post a video that will get you the maximum allowable points--whatever that means. She says it's fun, so that works for me. A guy's got to trust his mom, ya know? 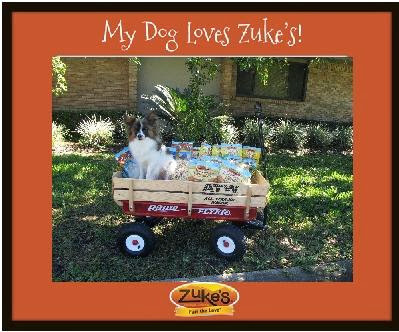 Video entries will need to follow 3 Event Barkers rules to be entered: (1) They must be Tweeted, (2) They need to add this statement, including the hashtags: "I #FueltheLove on #BarkFriday with @ZukesPets." and (3) the theme must be related to dog activities--any type of activity. I'm wondering if afternoon naps count as an activity? Hmmm....I'll have to ask Mom about that. She'll be around with her iPhone soon so maybe it's time for a snooze. I'll keep you posted. Hosts: @AllThingsDog, @EventBarkers, @DogTipper, @5MinutesforFido (that's me! ), and @ToDogWithLove. That's my friend Rocco's mom; I love to do zoomies with Rocco at conference hotels! Bonus: One winner will be chosen for a $100 Gift Certificate for their Video entry. Don't miss this chance to win big in the cash department. Note to Party Participants: This Twitter Party has a highly-unusual 2 hashtags. Please be sure to copy this hashtag onto your clipboard before you begin the party. This way you can paste it into each Tweet as you chat during the event. See you at #BarkFriday #FueltheLove! Petland at York Commons in Dayton is the closest Zukes retailer. The peanut butter hip action variety would be the one I would want to try with my dogs. Energy Treats for Active Dogs. Thanks! The skinny bakes would be good for treating without adding a lot of calories. The Lil' Links would probably be a hit with my dogs. The Z-Bones would be great to try to help with my dog's dental health. Thanks! I like that the people who have Dog Tipper also have Learnin2BGreen. Environmentalism is an important thing to me.